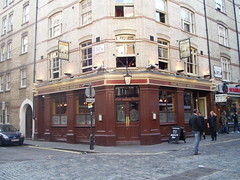 Samuel Smith's pub in Soho. The downstairs is quite dark, and the bar sits in the centre of the room taking up most of the space, so it's a bit of a squeeze to find somewhere to sit. There's an upstairs lounge as well; not been in there. Kake and Bec visited around 2pm on a Friday and it seemed rather understaffed for a Friday lunchtime; we had to wait for quite a while to get served even though there were very few other customers. We had two halves of wheat beer. They do food at least Friday lunchtimes — we saw a couple of burgers come out while we were there — but not sure of any other details. Last visited by Kake and Bec, 28 September 2007. Last edited 2013-09-03 21:36:53 (version 7; diff). List all versions. Page last edited 2013-09-03 21:36:53 (version 7).